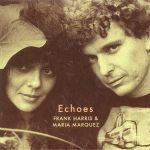 Review: Strangelove Music's latest vinyl-only outing dips into the infrequently explored archives of American multi-instrumentalist Frank Harris and collaborator Maria Marquez, a pairing that previously released a couple of sought after "ethno-wave" singles in the late 1980s. "Echoes" gathers together unreleased music made in 1985, presenting it as an unheard album that oozes off-kilter quality from start to finish. Most of the tracks were made using Harris' custom Synclavier synthesizer station, with his humid and breezy new age melodies and dreamy chords working brilliantly with Marquez's folksy, multi-lingual vocals, a variety of world music inspired rhythms and some seriously atmospheric field recordings. It's a formula that guarantees unusual but inspired results from start to finish.